Explore the breathtaking sights and sounds of Norway and experience nature’s wonders aboard the 28m Princess yacht Anne Viking. 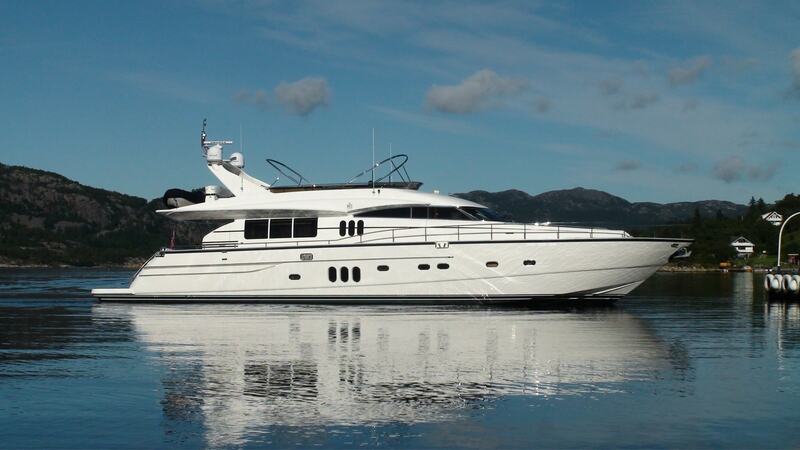 This beautiful charter yacht is designed to provide comfort and leisure while cruising the Norwegian fjords. She is capable of comfortably navigating narrow waters and can easily take her guests close to waterfalls and the coast to visit picturesque fishing villages, historic sites and cliff points with breathtaking views. Her crew of four has great local knowledge of the Norwegian coast and will do their utmost in ensuring guests have the perfect charter holiday. Anne Viking can comfortably accommodate eight guests in four cabins. A custom built yacht, Anne Viking has two large double cabins and two spacious twin cabins, all of them en suite. All staterooms are equipped with a TV and CD/DVD players. Her elegant lounge is complimented with opaque cherry wood panels, light carpeting and comfortable furniture. Guests can enjoy panoramic views from her large windows, which also allow for plenty of natural light. The yacht also boasts a state of the art entertainment system, including a fully integrated audio visual system with a 42″ plasma TV, home theatre, DVD and multi disc CD player. She has a dining room that can sit up to eight guests. Anne Viking has a wireless network access throughout the yacht. The yacht boasts a large aft deck ideal for lounging, dining or enjoying aperitifs while looking at the stunning landscapes. On the large fly bridge guests can also find comfortable seating as well as a bar, grill, sun lounger and a retractable Bimini top.